While at Science camp Pete had to pop down to base camp II to pick up some software, drop off our rubbish and pick up some food. This is an 8 hour round trip and while he was out he managed to get this wonderful picture of an Arctic reindeer. During our first few weeks on Svalbard, before any birds arrived, these were the only form of life we saw so we all become rather fond of them. 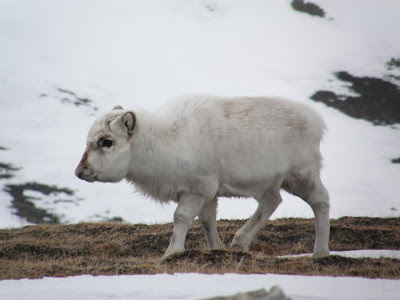 They are incredibly hardy, continuing to feed all through the winter by scraping at the snow with their hooves to get to the tundra below. By the Spring they are so weak, and sadly, we saw many corpses. This one is still young as it has no antlers, but even the full grown ones are not much larger than a sheep. Thanks to Pete for the picture.